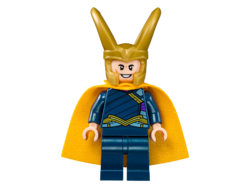 Loki is a minifigure in the Marvel Super Heroes theme released in 2012. Loki's torso, legs and arms are dark stone grey, printed to resemble his armour in The Avengers. He wears a green cape and a horned gold helmet. He wields a golden staff which is made up of two parts and his head is light nougat and printed with cheekbones and a stern expression. His appearance is identical in LEGO Marvel Super Heroes, except the sai in his staff is replaced with a glowing blue jewel. This same update was applied in Avengers: Age of Ultron sets featuring Loki's staff 76038 and 76041. Loki was the adopted son of King Odin of Asgard. Odin raised Loki as his own, alongside his biological son Thor, however when Loki discovered his true heritage, he attempted to seize control of Asgard and kill Thor. However, Loki's plan failed, and he was forced into exile. Some time later, Loki gained control of a Chitauri army through a deal with Thanos, and began an invasion on Earth. His first step was to seize control of the Tesseract, an Infinity Stone which was recovered by S.H.I.E.L.D. decades ago following a mission carried out by Captain America in World War II. After he gained control of the cube and took control of the minds of several S.H.I.E.L.D. personnel including Hawkeye, he put them to work on building a machine that would harness the power of the Cube open a portal between Earth and the Chitauri invasion fleet. He was briefly captured by S.H.I.E.L.D., but escaped and seemingly killed Agent Coulson. However, the Avengers managed to thwart the Chitauri invasion, and Loki was defeated by The Hulk. Thor then took Loki and the Cube back to Asgard. Loki was imprisoned for his crimes. After Frigga was killed during Malekith's attack on Asgard, Loki entered a uneasy alliance with Thor to have revenge. Though it appeared Loki, had eventually betrayed him to Malekith, it was revealed to be a ruse to have Malekith free Jane Foster from the Aether. While successful, resulted in Loki's death while trying to kill Kurse. However, Loki had survived, replacing and impersonating Odin. After the Silver Surfer's board was turned into cosmic bricks, Loki along with Doctor Doom assembled the villains of the Marvel universe to collect the bricks so they could build Dr. Doom's Doomray of Doom. Loki then recruited the Frost Giants to help him seize control of Asgard and retrieve the Tesseract. When Thor, Captain America, Wolverine, and the Human Torch came to stop him, he then activated The Destroyer, to halt them. Once Thor’s adopted brother and closest friend, the discovery of his own secret Frost Giant ancestry drove Loki mad. Now, twisted by evil, he seeks only power and revenge. A master of magical illusions, tricks and sorcery, the god of mischief will stop at nothing in his quest to conquer the world – or see it destroyed! Loki is the only Marvel minifigure to date that has no back printing. The prototype Loki used Bruce Wayne's old face, yet the finished one uses Bruce Wayne's new face. In LEGO Marvel Super Heroes Loki is voiced by Troy Baker who voiced Batman, Two-Face, Brainiac and Sinestro in LEGO Batman 2: DC Super Heroes and LEGO Batman the Movie: DC Super Heroes Unite. Loki is one of the main villains in LEGO Marvel Super Heroes.